The ‘Great American Pastime’ has returned in all its ceremony and pageantry, remembering the past and looking forward to the future. No day of the year holds out as much reason for hope. The lazy days of summer must be just around the corner. What better match-up to kick things off that Max Scherzer and Jacob deGrom going at it as the Washington Nationals hosted the New York Mets in the nations’ capital on a beautiful day. Scherzer had thrown only 7 pitches and struck out the first two Mets batters when Robinson Cano came to the plate and promptly sent a fastball 406 feet into the stands for a home run. New York ended up winning that pitchers’ duel two to zip. Opening day at Dodger Stadium in Los Angeles featured the newly revamped Dodger lineup, with legendary southpaw Sandy Koufax in the stands, taking on their arch rival Arizona Diamondbacks with ex Dodger pitcher Zack Greinke, who was greeted with a boisterous round of boos when he took the mound. Greinke ended up throwing 30 pitches in that first inning and left the mound one run behind his former team mates. He walked former DBack A.J. Pollack who now holds down center field for the Dodgers. Then Joc Peterson homered off ole Zack in the second. The New York Yankees started with the biggest money line number of opening day at -340 against the Baltimore Orioles. But then Tanaka took the mound, blanked the Orioles in the first inning and the Yankees put up 3 runs in the bottom of the first. It was pretty much over after that with New York winning the game 7-2. The Milwaukee Brewers took a close one from the St. Louis Cardinals by the score of 5-4 with veteran pitcher Jhoulys Chacin from Venezuela getting the W for the Brewers. Former Pittsburgh Pirate great Andrew McCutchen, newly contracted by the Philadelphia Phillies, hit a nice home run on opening day against the Atlanta Braves. He was followed by two other players making their Phillies debuts. Two time All-Star shortstop Jean Segura struck out swinging and the $330 million dollar man, Bryce Harper, in his first at bat in Philadelphia, grounded out to first. Hardly a prodigious beginning. So we are off again on what looks to be another great season of Major League Baseball. 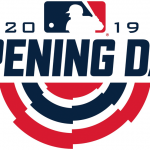 All around the country baseball fans are going out to the ball parks for a long awaited pastoral afternoon or evening, cheering for their favorite teams, and enjoying ‘Americas Favorite Pastime’ once again.